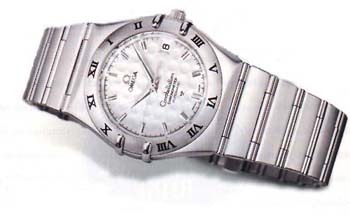 (2001, available in the USA only) An Omega Constellation automatic chronometer, but with a white dial pattern resembling the pips on a golf ball. Announced in June 2001, this all steel Constellation model was limited to 1,500 pieces and had a retail price of US $1,995. The case back is engraved with the inscription Ernie Els US Open Champion Limited Edition. Released in connection to Omega's sponsorship and participation as the "Official Timekeeper of the PGA TOUR and Senior PGA TOUR." 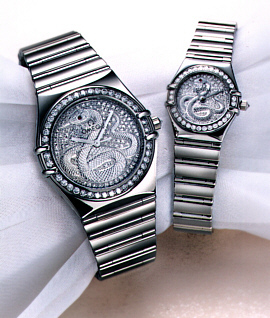 (2001, available in Hong Kong/China only) To celebrate the Year of the Snake in Chinese Lunar Calendar, Omega introduced a unique Omega Constellation Jewellery edition, the Snake Dial Pair Watch. From the official press release: "Snake, also called "Little Dragon" in Chinese, possess mysterious and cool appearance in contrast with their enthusiasm and passion inside. Mixed with these special features, the Snake Dial brings a distinctive and elegant style to the watch and thus the wearers." 18K white-gold cases, bracelets, crowns, and baguette-style hands. The crown is set with a diamond. Bezels are enhanced with 1.212 carats of diamond (gents' automatic watch) or 0.381 carat (ladies' watch). Dials are 18K white gold and diamond-paved with a hand-engraved snake in the center (with ruby as eye). The gents' watch features a Calibre 1120 self-winding chronometer movement, while the ladies' version features a Calibre 1456 quartz movement. Gents' version is water-resistant to 50m, the ladies' model to 30m. Both are equipped with scratch-resistant sapphire crystal, anti-reflective on both sides. Gents' is model no. 1900.40.51 with a retail price of HK$276,800 (about US$ 35,500). Ladies' is model no. 1960.40.51 with a retail price of HK$157,400 (about US$ 20,200). Not available in stores. But if your travels ever take you to the city of Taipei, you can see one of the more unusual and large Omega timepieces in the world. Accurate timing via a link to the global GPS network. Three-sides clock tower an Omega clock resembling an Omega Constellation on each side. During the night, the clock tower radiates colourful light to attract attention. A plate at the base of the clock with the handprint and signature of Omega ambassador Cindy Crawford. The clock was donated to the city of Taipei in a ceremony in 2000 where by Omega ambassador Cindy Crawford presented a model of the to-be-built tower. 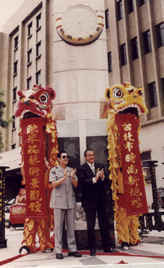 Construction on this clock was completed in June of 2001 and inaugurated on July 11 in another ceremony that included Mayor Ma, the Mayor of Taipei City, and Mr. Stephen Urquhart, the president of Omega.